The study design described here is a posterior C1–C2 fusion technique composed of bilateral C1 hooks and C2 pedicle screws. In addition, the clinical results of using this method on 13 patients with C1–C2 instability are reported. 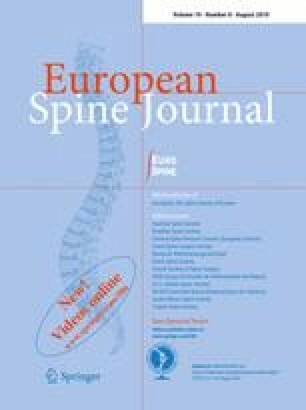 The objectives are to introduce a new technique for posterior C1–C2 fusion and to evaluate the clinical outcome of using it to treat C1–C2 instability. From October 2006 to August 2008, 13 patients (9 men and 4 women) with C1–C2 instability were included in this study: 3 had acute odontoid fractures, 4 had obsolete odontoid fractures, 4 had os odontoideum and 2 had traumatic rupture of the transverse ligament. All patients underwent posterior atlantoaxial fixation with bilateral C1 hooks and C2 pedicle screws. The mean follow-up duration was 25 months (range 13–30 months). Each patient underwent a complete cervical radiograph series, including anterior–posterior, lateral, and flexion–extension views, and a computed tomographic scan. The clinical course was evaluated according to the Frankel grading system. No clinically manifested injury of the nerve structures or the vertebral artery was observed in any of these cases. Five patients with neurological symptoms showed significant improvement in neurological function postoperatively. Bony fusion and construction stability were observed in all 13 patients (100%) on their follow-up radiographs, and no instrument failure was observed. Bilateral C1 hooks combined with C2 pedicle screws can be used as an alternative treatment method for C1–C2 dislocation, especially in cases not suitable for the use of transarticular screws. The clinical follow-up shows that this technique is a safe and effective method of treatment. Z. Zhu and B. Ni contributed equally to this article. Supported by Science and Technology Commission of Shanghai Municipality (NO. 08411952400).